It was still raining on the weekend but we decided to go out for yum cha (dim sum) anyway. 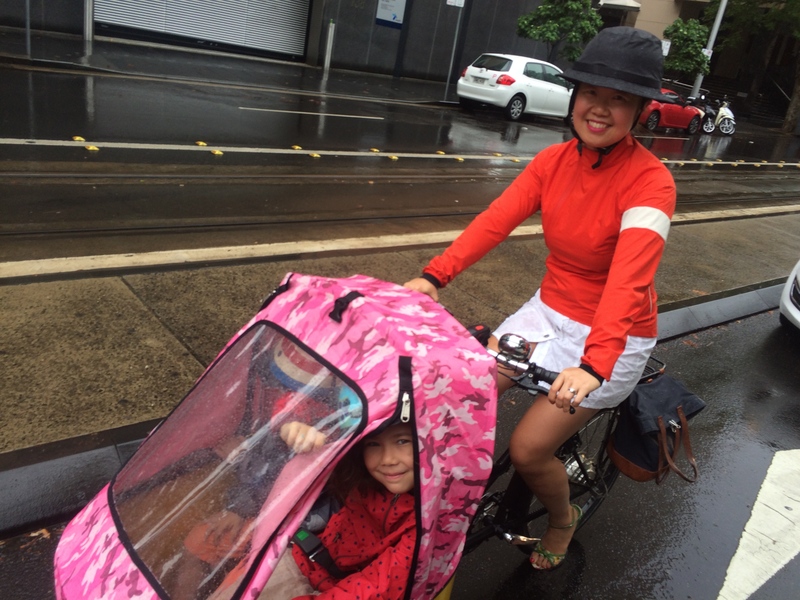 The Nihola tricycle has a wonderful rainproof cover that keeps the kids warm and dry. The first one we had wore out very quickly. We used it every day because Julius was six months old when we first took delivery of the Nihola. The pink camouflage version (quite ironic as it’s highly visible!) is the second one that we purchased direct from Nihola in Denmark. I’m wearing a Rapha rain jacket. It’s super technical and keeps me dry as it also breathes. The shape is awesome as it follows a woman’s silhouette. Underneath is a white cotton summer dress purchased from one of super-cheap clothing shops on Oxford Street in Darlinghurst. I bought the wedge sandals from Zara in London about thirteen years ago. I’m glad as I brought them to Sydney all those years ago as it seems the wedge has some staying power (for now at least). I found them in my closet this Spring. I decided to wear this combination as the top of me tends to get the most wet when it rains. I thought I could dry my legs and feet off in the bathroom of the restaurant. The Yakkay helmet with raincover has shown its usefulness! The kids both have Little Nutty helmets. We ate like kings and then had cheese sandwiches for dinner that night. Is it not possible to overeat at yum cha? I don’t think so! Inherent weakness rises in all of us while facing the trolley full of egg tarts, mango pancakes and jelly in lurid colours. Stay dry and Happy Cycling! Previous postIt Started Raining and Didn't Stop! Next postA Reminder of Autumn after “The Rains”. Since your first post,i’ve enjoyed & admired this delicious little blog. I’ve thoroughly enjoyed your posts thus far and can hardly wait for your next instalment. Please do keep the witty & informative posts coming.